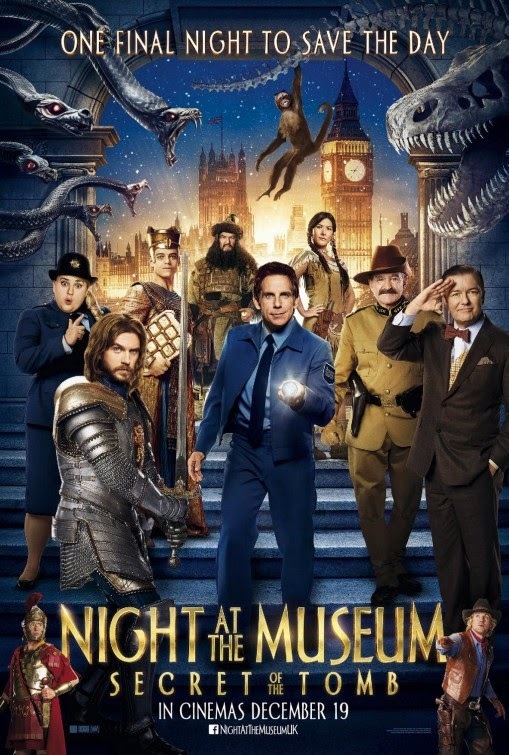 You probably shouldn't expect too much out of the third installment in a corporate kiddie franchise like NIGHT AT THE MUSEUM: SECRET OF THE TOMB. Those low expectations combined with sad recent events involving one of the film's supporting players, Robin Williams, come together to give what might otherwise have been a throwaway scene some genuine emotional impact. If you don't tear up at least a little bit when Williams, as Teddy Roosevelt, gives his farewell speech, your heart must be made of stone. The plot this time around finds the magic tablet that allows the exhibits in the American Museum of Natural History to come to life losing its power thanks to some kind of mystical tarnish. To find out what's wrong, museum guard Larry (Ben Stiller) sets off to the British Museum at the suggestion of Ahkmenrah (Rami Malek). The young pharaoh believes his father Merenkahre (Ben Kingsley), on display at the other museum, will know what to do. Other exhibits coming along for the trek are Teddy Roosevelt (Williams) pint-sized cowboy Jedadiah (Owen Wilson) and diminutive Roman Octavius (Steve Coogan), Attilla the Hun (Patrick Gallagher), and Sacagawea (Mizuo Peck). Larry's teenage son Nicky (Skyler Gisondo) also tags along, as does one of the museum's Neanderthals, Laa (Stiller again), who believes Larry to be his father. Oh yeah, also the monkey who likes to pee on people, because that never gets old. At the British Museum, Larry meets his female counterpart Mindy (Rebel Wilson). And since the magic tablet has come along with Larry and the gang, the exhibits in the new museum come to life as well, most notably Sir Lancelot (Dan Stevens, of Downton Abbey fame). SECRET OF THE TOMB is, like its predecessors, a serviceable family-friendly comedy. It probably exceeds the legal amount of monkey urination jokes allowed per film, but the target audience of 8 year olds won't mind. There's a moral about kids and dads learning to trust and respect each other, and I suppose some kids might be inspired to delve into some actual history or at least visit their local museum. Nothing amazing, but if nothing else it proves a respectable swan song for Robin Williams. 2 out of 4 stars.